Wednesday, Friday and Saturday of this week are the Lenten Ember Days. Ember Days are three days of fasting and prayer traditionally set aside to mark the turn of each seasons. After Vatican II their celebration was made optional. In the wake of last summer’s flare up in the clergy sexual abuse scandal I told you that I was reviving my own personal commemoration of Ember Days. I told you that I would be setting these days aside as days of fasting and prayer to ask God to drive out the sin of sexual abuse from the church. I said I would also make the healing of sexual abuse victims an intention of my prayer. For both the fall and winter Ember Days I invited parishioners to join me at a Penitential service on Friday afternoon at 3:00PM. About thirty to forty parishioners have joined me in a holy hour of prayer and Eucharistic Adoration. I will be holding a holy hour again for this week’s Lenten Ember Days. I’d like you to join me later this week. Bishop Edgar DaCunha, Bishop of Fall River will be conferring the Sacrament of Confirmation on confirmandi from the lower and outer Cape Cod parishes at St. Joan of Arc Church in Orleans next Saturday, March 16, 2019 @ 10 AM. Please pray all the candidates including our own will be filled with the gifts of the Holy Spirit. Pray they will use those seven gifts to become faithful and missionary disciples of our Savior Jesus Christ. Today’s Second Collection is the annual collection for the ministry of the Catholic University of America. Catholic University was founded by the American Catholic Bishops late in the Nineteenth Century as a world class center for scholarship and academic research. It is located in Washington, DC. Today’s second collection helps to continue that tradition educational excellence. The Lenten Season began last Wednesday. Lent is a forty-day retreat preparing every Catholic to spiritually celebrate the Passion of our Lord Jesus Christ during the Easter Triduum. It is meant to be a time where Catholics reflect on how God is calling each member of the Body of Christ to become more faithful missionary disciples. During Lent we reflect on how Jesus is calling us to come to know him more faithfully and encourage others to do the same. Lenten Folders-Parishioners on our mailing list received a Lenten Folder last week. We ask you put aside a quarter a day for a total of $10 over the entire Lenten season. Your donation will be combined with other parishioners’ donations and sent to Food for the Poor to build a modest home for a family in Haiti. The cost of a home is $3,600. Last year parishioners donated $4,000, for this purpose. How about building two homes this year? Additional Lenten folders are available to be picked up at the back of the church. Friday Program-On the Friday afternoons of Lent we will be reciting the devotion of the Stations of the Cross in the Church at 4:30PM. 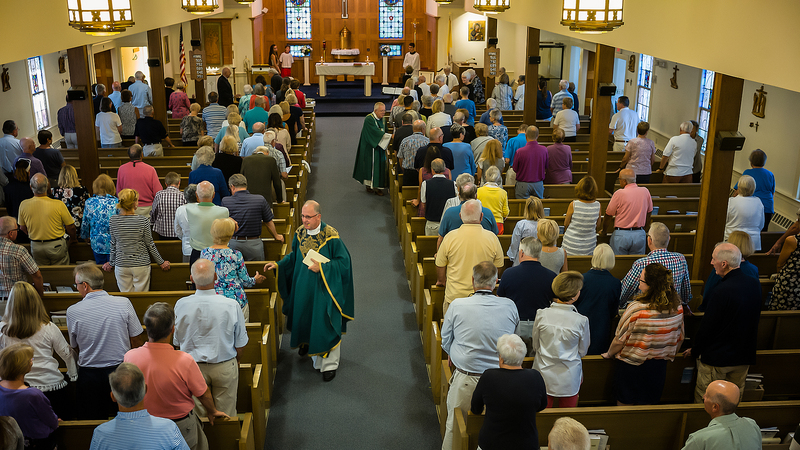 Each week a different parish ministry will lead the recitation of the Stations. The version of the Stations used will reflect the theme of their work. This Friday the Stations will be led by members of the Holy Redeemer Woman’s Club. They will recite Mary’s Way of the Cross. After the Stations you are invited to share a simple supper of soup, bread and beverage. Following the meal, a short twenty to thirty-minute presentation of a segment of Bishop Robert Barron’s program, Priest, Prophet, King, will be offered. This week’s presentation is entitled, “Adoration”. Come join us for all or any part of the program. Some copies of the Lenten editions of the scripture guide “The Word Among Us” are still available at the back of the church. Please help yourself to a copy or two. We don’t mind if you take an extra one or two to share with others. Two weeks ago, Ginny and Joe Vatelli spoke at the masses about Marriage Encounter Weekend. A weekend is planned for April 13-14, 2019, at Our Lady of the Cape, Brewster. Ginny and Joe left some application on the table at the back of the Church. If you would like to participate in a weekend please take one or register at www.wwmeMA.org or call 800-710-WWME (9963). Over the last few weeks the parish has been the recipient of some very nice generosity. A couple who are seasonal parishioners made the parish the recipient of a yearend donation of $10,000 from their retirement account. Another sent a $2,500 contribution. We were also the beneficiary of a very generous $100,000 legacy from the estate of Giles Chapin, a parishioner who died last year. Have you considered Holy Redeemer as a beneficiary of your will, retirement annuity or insurance policy? Using some of your residual estate to help finance the spread of the gospel and do works of charity here in our parish is a good way to show our love of God.